In the previous article I have explained Display records in Gridview from sqlserver database using WCF service , Create and Consume WCF Service using visualstudio 2013 and How to insert record into Sql Server database using WCF service. Create store procedures to Insert, Update, Delete and fetch record. Now open the Iservice.cs file and remove the sample code from it. 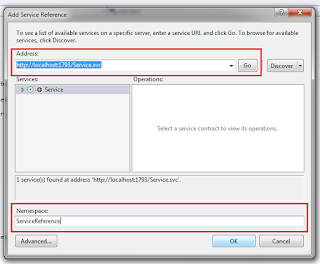 Write the below given code in Iservice.cs below the ServiceContract. Write the code to define the definition of function to insert, get, delete and update the record. To consume the WCF service creates a new website. After creating new website go to Solution Explore and Right click on Website >> ADD >> Click on Service reference. On click Add service reference pop up will be open. 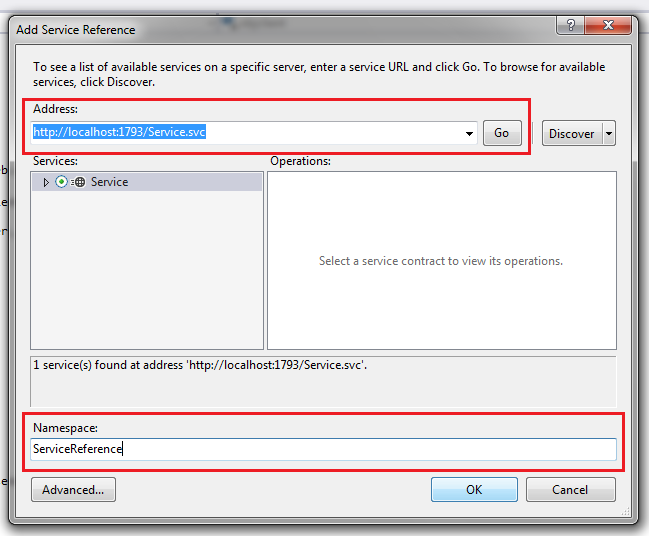 Copy the URL of WCF service and paste it in displaying input. Enter the namespace and click on Go button. In this website ServiceReference is the namespace. Realy Good Post. Thank You.